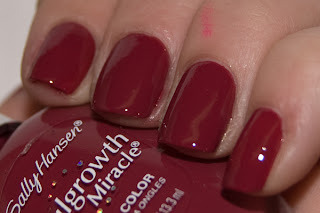 I picked up some pretty Sally Hansen Nailgrowth Miracle color today! I've been wanting to do this for a while now. I applied a lovely manicure today with my pretty new color, and we are going to test it's guarantee!! 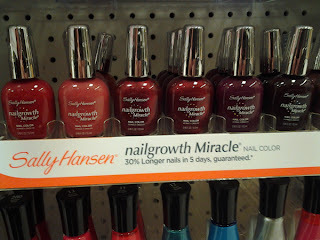 The tagline and promise is "30% longer nails in 5 days, guaranteed*!" I am assuming it means 30% of length from my cuticle to the end of the bed, NOT including any free edge tip! That being said, 30% is a LOT more than I would ever give this stuff credit for. Are you kidding me? That's like 3 millimeters, or just over 1/4 of a centimeter. 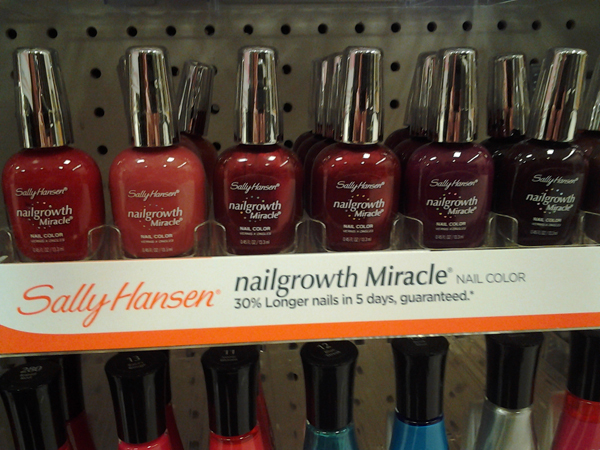 Yeah, doubt that would happen from less than a week of nail stuff. It does not specify how to use it. Do I apply every day? Every other? Doesn't say. The 'treatment' bottles say every other day on clean dry nails, but the color says nothing of the sort. What I will be doing with the majority of my nails is completely leaving the polish alone, and measure just based off of the regrowth at my cuticles. Seems fair. With my pinkies, however, I will remove the polish with non-acetone remover every night and reapply. Then just see what happens!! Here is evening of application! Isn't this color WONDERFUL!? It's called Beautiful Berry. Irl, slightly more of a dusty shade than you see here, but very close! I've gone ahead and topped this off with Revlon Extra Life, No Chip topcoat...This will also be a test for that. After that, because I am impatient, I dropped my Qtica half time drops on them. Another test...Can I not pick!?! 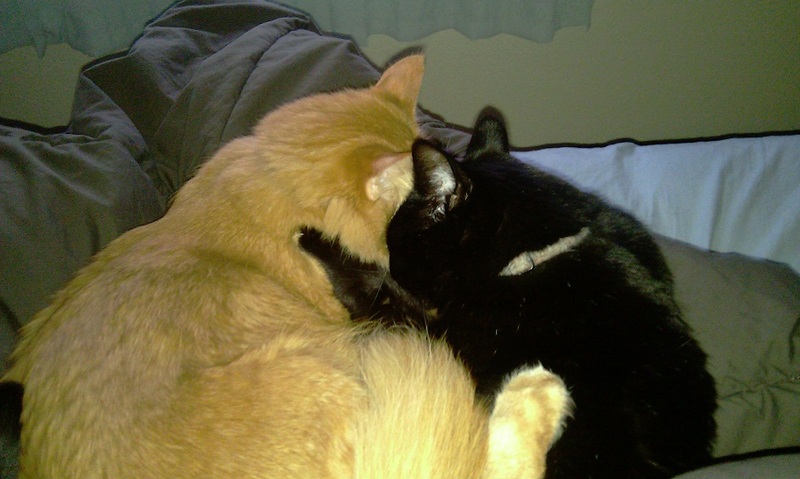 I have to leave these suckers alone for almost a WEEK!!! The easiest place to pick is at the cuticle, and that will completely ruin my test! Challenges all around!! This will be going on until Tuesday night! That will be officially 5 days. Apparently you have still been required to word verify to leave a comment and I am SO sorry! Personally, it makes me not always want too, because I'm lazy...I thought I fixed it but I guess maybe I didn't save it? It should not force you to do it now. Let me know if it does! Hello! It's been so warm lately. I've been enjoying it so much, I thought I would go ahead and share it on my nails!! Also I've been wanting to do tips for a while, AND I got new Zoya. What a better way to play?! This here is Zoya Jancyn, with Sinful Colors UFO over the top. I wanted glitter. It's not like Jancyn isn't just beautiful all by itself... it's just that...GLITTER!! I threw the fimo on as an afterthought. I felt it needed just a little something more. I would usually place the fimo over the topcoat, but I cut it so thin it flattened out with no problem at all. My kitty for reals is orange, so this reminds me of him! This is Dr. Frank-N-Furter!! He likes to drink out of faucets and sleep on his back. We got him thinking he was a girl...his siblings were VERY clearly boys. We brought 'her' home and named her Trixi. That was great and all until we noticed tiny male kitty parts on him...That's where his new name comes in! 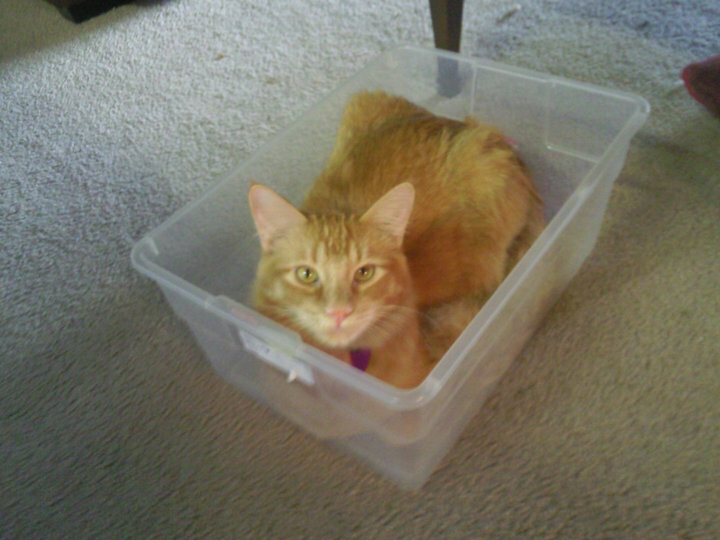 We call him Frankie for short! Loves to everyone! Can't wait to see more happy springy manis!! I've been hiding this week! Busy reading The Hunger Games! All the hype finally caught up with me and I picked up a copy. Almost done with all 3 now. Woot. Anyhow, I remembered that I picked up a couple of CH HG collection and threw on Stone Cold. I got it because it was a fancy matte. But now I feel I need the whole collection; seeing as I am a big fan and all, now. Thought I'd share this with you, just in case you were on the fence about getting it. 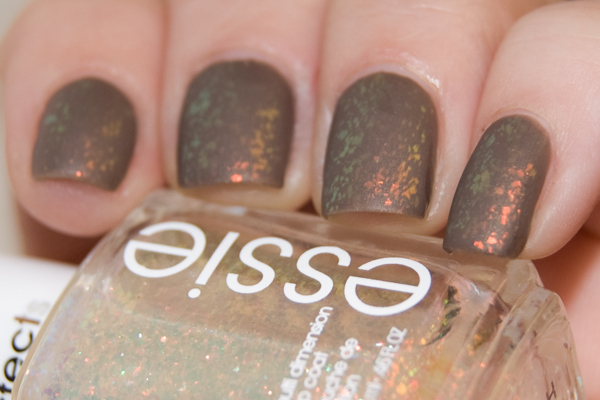 Its such a lovely matte, and looks great with a shiny topcoat as well!!! As for the books...I was very undecided as to whether I liked The Hunger Games until the end. It's just depressing. But then you fall in love with Katniss and end up liking it anyway. I recommend reading it if you haven't. Before I read it I didn't realize it was as big as it is. I thought it was just a 'soso, lots of people know about it but it's not crazy' kind of book. Then when I decided to get into it I realize how wrong I was! Don't spoil anything for me! I'm not done with Mockingjay yet!! I've been gone this entire week exploring the South! I went to Durham, NC to visit some family attending Duke. While away I managed to only bring 3 bottles of nail polish with me. 2 different greens and a Seche Vite. Go me right? I ended up buying 3 bottles, including my first Butter London! =D I'd say I deserved it for being so good about not buying! Anyway, here's Butter London Muggins! It was so difficult to decide which one to get. It was fun to see them at a cute little shop/café in Durham. There were the only polish there! Also it was a dollar cheaper than at Ulta, so I figured, why not? North Carolina was fun! I didn't take pics because I am lazy. My bad. Great vacation though, and well needed! Fun story; on March 16th I found a 4 leafed clover! Then on March 17th I found 7 more... I gave a few away to kids I found around. Because what is cooler than a 4 leafed clover on St. Patrick's Day??? Anyhow, sorry about the 2 week absence; I'm back! I've been busy the last few days!! I had a GREAT Nail Polish party with my friends on the 1st. No pics this time...Yeah forgot cameras. Been working on a new system for work...Been CRAZY! Well, here's my mani, and one of my FAVORITE looks ever, then more story! Please, click the images to see the effect of the flakie! 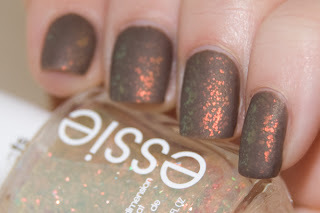 I LOVE this Essie topcoat. It's Shine of the Times. I feel a little behind the times, everyone else has already gotten over the fleck fad it seems, but not me! Still in love. Anyway, Its SotT over CH Ingrid. I mattified it with Hot Topic's war paint mattecoat. 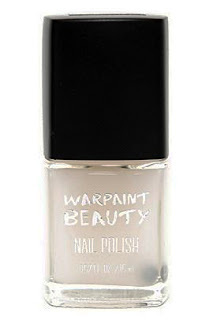 It's like 3 bucks and works as well as, if not better, than my $10 Sephora topcoat. So go to the mall and pick one up if you don't have one! 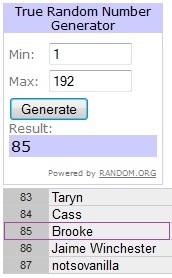 Anyhow, so re-grats to the winner of the giveaway! It was a ton of fun. Brooke loved the fleck effect! What's great, is I got to actually meet up with her IRL, seeing as she lives near. AWESOME yes? She is way cool, and it's always fun to have friends who share your hobby or obsession. You can never have too many! Over 9000 winners! No wait.. just one! The giveaway ended today! Or rather, this evening. I couldn't wait and just HAD to pick a winner. There was a total of 192 entries. WOW guys, thank you so much! This has been so much fun, and I can't wait to do it again!! Well, get on with it, right? Here is a fabulous screencap (or it didn't happen, right?) of the winner! Lucky number 85!! Congratulations, Brooke! I am so excited to get you your Fleck Effect!! Hope to hear from you soon! 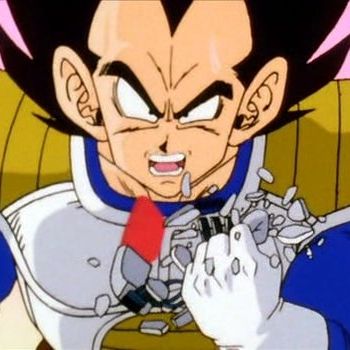 Just over 9000 pageviews is when I decided to create this giveaway, I now have over 14000! Thanks to ALL who entered! You all have made me a happy blogger. Stick around for more, you never know what crazy event may happen to trigger another giveaway!